I’m so thankful for those words of wisdom because they are absolutely right! Every single day, we have two choices: we can simply react to everything happening around us, or we can take action and create the lives we want to live. 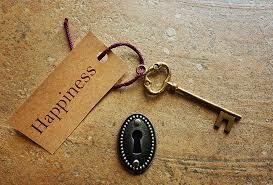 Don’t give someone else the keys to your happiness! I’ve known people who have everything they’ve ever wanted, but they’re miserable. No matter what people do for them, they’re always blaming somebody for something. On a bright sunny day, they find the one cloud in the sky. Then I’ve known people who have gone through hard situations, but they’re still the happiest people I know. Nothing can steal their joy. Why? Because every person’s happiness is ultimately their choice! If we put our happiness in other people’s hands, we’re going to be disappointed. It’s incredibly freeing when we take back the responsibility for how we feel. When we react to others’ actions, it sets us up to be the victim. When we maintain the fact that we own our emotions, we free ourselves to be victorious in all circumstances! The keys are in your hands—what are you going to do with them? Dear Lord, thank You for giving us joy. Help us to take the responsibility for how we feel. Help us not let those around us steal our joy. In the Name of Jesus, Amen.